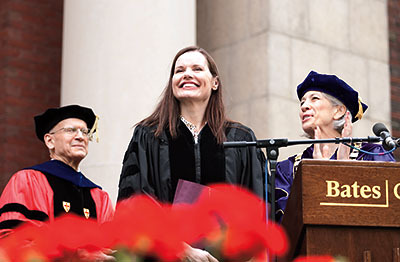 Honorary degrees, on May 31 at Bates’ 143rd Commencement, to: Geena Davis, Academy Award-winning actress and founder of an organization researching gender bias in film and television; the Rev. Robert M. Franklin Jr., president of Morehouse College; biomechanics researcher Mimi A.R. Koehl; Maine philanthropist Ralph T. Perry ’51; and columnist and CNN host Fareed Zakaria. They Were Very Beautiful. Such Things Are, personal narratives collected from refugees in the camps of Dadaab, Kenya, and from diverse Lewiston residents; edited by Assistant Professor of Education Patricia Buck and Rachel Silver (Booklocker.com Inc., 2008). The Harward Faculty Award for Service-Learning Excellence to Alexandre Dauge-Roth, assistant professor of French. Dauge-Roth, one of three Maine college professors to receive this Maine Campus Compact award in 2009, was honored for his efforts to engage students with survivors of the 1994 genocide in Rwanda. A Thomas J. Watson Fellowship to Sulochana Dissanayake ’09 of Pita Kotte, Sri Lanka, who will use the $28,000 award to study theatrical arts in South Africa and Indonesia. William Stringfellow Awards for Justice and Peace to Rachel Salloway ’09 of Providence, R.I., for a commitment to social justice focusing on healthcare equality, and Sarah Standiford ’97, executive director since 2003 of the Maine Women’s Lobby and the Maine Women’s Policy Center. As director of writing, Hillory Oakes, effective Aug. 1. Oakes fills a new position that will coordinate, advance, and oversee the College’s robust efforts to support student writing skills and the role of writing in the curriculum (“Composition One-on-One,” Spring 2008). Previously she served as director of the Munn Center for Rhetoric and Communication at St. Lawrence University. Genetic research involving the bacterium that causes Lyme disease, by biochemistry majors Nick Swerdlow ’09 of Hastings-on-Hudson, N.Y., and Josh Linscott ’10 of Portland, Maine, two of 78 undergraduates presenting research to members of Congress in May during Posters on the Hill, an annual event sponsored by the Council on Undergraduate Research. Anne Dodd, senior lecturer in education, effective July 31. Described by colleague Helen Regan as the “rock of the department,” Dodd started at Bates in 1984. Mary Gravel, assistant to the dean of students, effective June 30. Known and loved by legions of students, staff, and faculty, Gravel came to Bates in 1983. Joseph Pelliccia, associate professor of biology, effective July 31, after 30 years at Bates. Pelliccia led the establishment of a principal-investigator approach to biology instruction and was one of the first faculty liaisons with the admissions office and with athletics. One case of the H1N1 flu virus in the Bates community, reported by a student who suffered mild symptoms and left campus May 31. The student informed people on campus with whom she had close contact, and Bates reported it to state authorities. Mary I. DeAngelis, a custodian for Facility Services from 1968 until 1985, on May 16, at 88; R. Bruce Huntington, computing technician for Information and Library Services from 1987 until 2003, on April 5, at 80; Ann M. Parks, manager of Design Services from 1997 until 2001, on March 7, at 70; Arthur A. Provencher, a member of the Dining Services staff from 1987 until 1999, on May 16, at 91.